I'm not sure there's a precise definition of "weight loss plateau," so I'll say that mine really got underway twelve days ago. Both charts cover the same time period, December to the present. 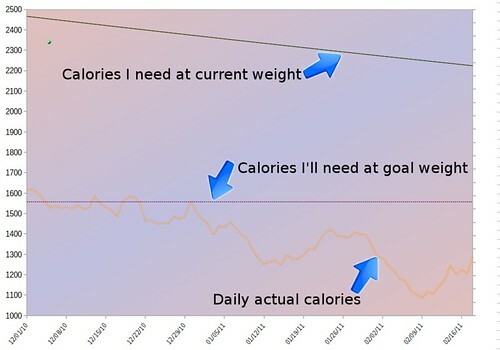 This plateau started when my average calorie intake (the orange line) declined sharply. I tried jolting myself off this plateau with high-calorie days, but I was really uncomfortable with that approach. It felt out of control, like the thin end of a very familiar wedge. Next I'd be riding waves of ice cream with a pound cake surfboard, and that would be the end of that. Theories about altering the ratio of macro-nutrients (fat, carbs and protein) very quickly started to feel like the old magical thinking (Atkins diet! Whee! Eat as much meat and cheese as you want! It's magic! ), distracting me from the basics of energy in and energy out. So, after much sturm und drang over this frustrating setback, I've decided just to carry on, with a slight nudge back up in daily calories. My body simply can't decrease its metabolism forever--even if I were in a coma and the feed tubes were delivering my current calories, I doubt if I would gain any weight. Since I'm not in a coma, eventually the fat cells will just have to surrender their greedy grip on the groceries. Meanwhile, I feel strong and well, and very far from comatose. 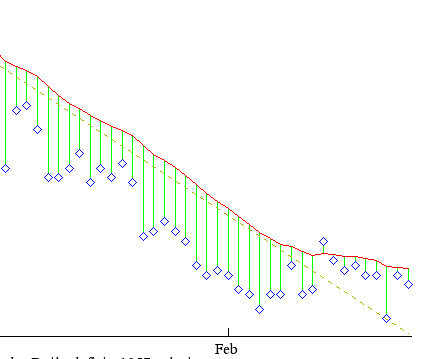 And what, after all, is a two-week plateau in a diet that's going to last well over a year?